with hydraulic valve lifters as they do not allow for requied clearances. colapsed push rod on assebmbly. the 49 to 51 F/H fords did have rotatables. Bill, sounds like a couple of things could have happened here. Someone may have used an aftermarket valve that was "close" but positioned the spring retainer lower on the stem. 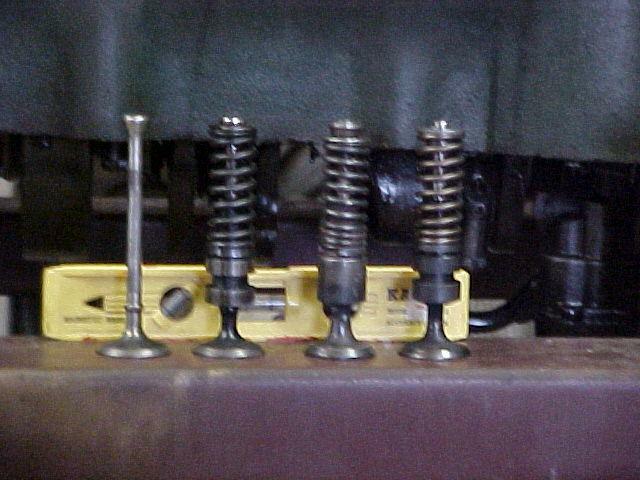 The straight stem valves used on the '49 to '53 Fords position the spring/retainers exactly in the same location as on the regular mushroom style stem used on the Zephyrs and pre '49 Fords. The mushroom style stem valves are still available if you choose to use them. Another possibility is that the valve seats and/or the valve heads were faced/ground way too much positioning the stem further down and approaching the boss of the tappet bore. The spring retainers were fairly close to begin with making clearance checks difficult. To my knowledge there were no "rotators" with either design of valve stem for Fords? If the valves themselves are the problem ( not Ford) you may be able to use either the straight or mushroom style Ford valves when you rebuild. If the valve seats in the block have been ground too deep you may have to have new seats installed. Let us know what you find. are to high and may have to go to the 15/16th's bore size. problem unless I change the crank with a 2.250 journal's. Possibly it would be best to sleeve it and stay with the 292 Cu.In. Bill, sleeving one of these engines is fairly expensive and you still have to buy new pistons. Unless there is a lot of taper or deep pitting in the bores they should clean up at .060" over or less. The block could even be safely bored another .0025" to make it a standard 2-15/16". Oversize pistons along with all other new parts for rebuild are available. The post-war crank would be the one to use not so much for the size of the journals but because there are no sludge traps to clog up. If your oil passages are all clear in your crank you may be ok? New bearings in standard and undersizes are available for these cranks also. I recently finished rebuilding a 292" '47 engine and used the Ford change-over valve kit to redo the valves and guides. The only advantage doing this is in future disassembly ease and perhaps the seals on the intake guides. Your camshaft may be grindable, mine had some pretty good size nicks in some of the lobes and they were able to regrind it. I'd have it checked before condeming it. Lobe(s) can be built up if necessary but this can too become expensive so you have to weight the costs. I would regrind or micro polish the cam in any event along with resurfacing the lifter bodies. There's probably enough meat in the cylinder walls that you could even go .010" to .020" over on the 2-15/16" bore. I'm presently doing a "big " 12, boring a '42 block to 3-1/16" and using standard early Ford pistons. I'm holding my breath on this! bore, which will also take care of some of the taper I noticed. valve head,which I assume is a stop for the valve guides. Probably a truck Flat head fly wheel! be the same as a later flat head? You don't state what year V 12 you are working with.Peechers advise on the crankshaft is good. The post war crankshaft offers more meat on the journals, but you aren't going to race this engine are you? I would be cautious about going too large on the bore. Egge will make up pistons any size you need. You shouldn't bore in excess of what you need to clean up the bore. Some day it may need to be bored again and you don't want to strike water when you bore. Solid lifters, adjustable or solid, should only be used with a cam that is ground for solid lifters. I have seen a couple of V 12s that the lobes were badly worn when solid lifters were used. Cams for hydralic lifters are ground to slap the base of the lifter sharply in order to close the check valve. Solid lifter ground cams have a slopping step on the lobe to ease the valve up and down. 15/16 would take care of it. measurements would not be so out of round. Bill, clearance ramps for adjustable tappets can be easily added when the cam is reground. If you use the adjustable tappets the clearances would be the same as the '36 and '37 12's. Many guys have gone this route and there are some advantages. You can eliminate the secondary oil line that feeds the lifters but you must provide a pressure relief passage at the front relief valve in order to assure lubrication to the timing gear. With the proper cam grind the engine will run as quiet as a flathead Ford. The hydraulic tappets of course will run a tad quieter as long as as long as they are in good shape and oil pressure is decent. I have worked with is the later. I think you meant .190" to .196" for the cylinder wall thickness? I've never seen a Zephyr engine with those one piece hydraulic pushrods. I'm guessing, but that may have been the design of the very first ones used in '38? Old Henry was loathe to pay anyone any royalites but probably decided to use the Eaton design for all the later engines? Just speculation. The one piece design seems similar in concept to "modern" hydraulic lifters but there might have been some good reason to discontinue their use and someone out there might have a better answer? I have a good cam (marked 06H) i just took out of a bad block. interested in other stuff too.